A recent survey from YouGov reveals widespread knowledge of cryptocurrencies in the United States, the report also shows mixed sentiments toward the technology. YouGov, an international market research and data analytics firm, gathered data from 1,202 participants at the end of August; the poll results showed an interesting disparity in knowledge of cryptocurrency and the actual adoption of it. The poll found that 79% of Americans were familiar with at least one cryptocurrency with Bitcoin being the most prevalent among 71% of people who said they knew of it. Ethereum came in second at 13% with Litecoin and others trailing behind. 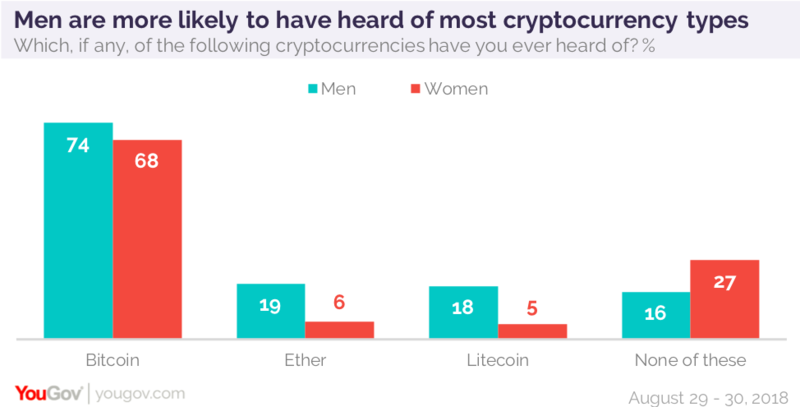 With a vast majority of respondents knowing about cryptocurrencies, a greater disparity is revealed. Of those who said they knew of Bitcoin, 87% said they had not interacted with it; this includes buying, selling and mining. Some 49% of the Bitcoin-aware group said, “I’m glad I didn’t buy Bitcoin earlier, and I don’t plan to buy it”, while another 15% wish they had bought earlier and now feel it’s too late. In contrast, a South African poll showed that 38% of its respondents wished they had invested sooner. Despite this, 36% of people in the YouGov poll thought that it cryptocurrencies will eventually be more widely accepted as a means to purchase goods and services legally within ten years, while 34% disagree and don’t think this will be the case. In this group, millennials made up the majority of those who believed in crypto acceptance with 44% polling favorably. About 25% of poll respondents think cryptocurrencies are used mostly for illegal purchases, which is a traditional but waning view. However, this skepticism does hold ground in America due to the connections found between Bitcoin and the 2016 election hacking scandal. With regards to cryptocurrency acceptance, a positive sentiment towards cryptocurrencies is growing in the states, just over a third of those who believe in wider crypto acceptance say they have interest in primarily using crypto over the US dollar. In July, a Wells Fargo Gallup Investor and Retirement Optimism Index poll gathered data from 1,921 investors over 18 years of age with at least USD 10,000 in traditional investments. It revealed that 2% of respondents owned Bitcoin, and younger investors were keener to adopt Bitcoin should cryptocurrencies become more mainstream, a growing sentiment among millennials. Other polls found that 50% of participants from a 2,000 person survey “would like to try out Bitcoin“, with millennials of low income being the most likely to invest. In South Korea, surveys show that cryptocurrencies are rising in popularity, and in the United Kingdom, it was reported that 3 million people have invested in Bitcoin. The post New Survey Shows Mixed Sentiments in Bitcoin, Crypto Mood in the US appeared first on BitcoinNews.com. This entry was posted in America, bitcoin, Bitcoin Investors, Bitcoin News, News, Poll, Research, study, survey, united states on September 7, 2018 by adminbtc. Global payment blockchain solution Ripple has managed to secure former US President Bill Clinton as a speaker for its autumn technology conference, Swell. Clinton is set to deliver a keynote speech followed by a Q&A at the San Francisco event on 1 October, as outlined in a blog post from Ripple on Tuesday. The post commends Clinton on his handling of the internet phenomenon during his time in office, as well his endeavors to make technology accessible for underprivileged communities internationally. Comparing the current period of technological advancements with that of the 1990s ushered by Clinton, Ripple cites his credentials as valuable for interpreting the climate of today which requires a similar ability to balance risk prevention without stifling innovation. Clinton received a physical Bitcoin from entrepreneur Matt Roszak back in 2016, although his wife Hillary Clinton refused to accept campaign donations made with Bitcoin during her two presidential runs. Swell will be moderated by Gene Sperling who served as the National Economic Council Director and Adviser for Clinton as well as former President Barack Obama. As politicians globally have begun demanding some form of regulatory control over the cryptocurrency industry, politics has drawn much closer to the field over the year. While in the US, the Securities and Exchange Commission is tightening its stance on ICOs and has even employed its first ‘crypto czar‘, companies themselves serving the industry are becoming more politically active. Recent documents show Coinbase as the first of its kind to form its own political action committee (PAC), which would allow the exchange to donate to candidates in the US running for public office that accept crypto donations. As of yet, the PAC has listed no affiliations or lodged any donations, nor did it wish to respond to press requests for comment. It will be interesting to see in the future if the industry may develop political power via these crypto-friendly PACs. The post Ripple Books Bill Clinton for Keynote Speech at Fall Conference appeared first on BitcoinNews.com. This entry was posted in Altcoins, America, Bill Clinton, bitcoin, Bitcoin News, Blockchain, conference, Cryptocurrency, hillary clinton, News, political action comittee, Political Action Committee, Ripple, Securities and Exchange Commission, Swell, Technology, US on August 2, 2018 by adminbtc. Hundreds of cryptocurrency enthusiasts have reacted to John McAfee’s Sunday night Twitter announcement of his intention to run for the US presidential elections in 2020. The Tweet has currently generated almost 800 comments, generally positive, and over 5,800 likes. In 2016, he was nominated for the Whitehouse race by the Libertarian party. He lost to Garry Johnson; the New Mexico governor. In his Sunday message on Twitter, McAfee openly expressed his love for the cryptocurrencies, saying he aims at serving the crypto community if he is elected as the president of the United States. While some criticized the decision, many applauded him for his decision. A quick scan of the twitter comments indicated that many within Twitter would back him for the upcoming election. The self-styled ‘Crypto Dad’ has a recognized influence within the crypto community, with past analysis showing that a single tweet from John McAfee has managed to move markets. Thus, the hypothesis that crypto fans will vote for him because of his apparent interest for cryptocurrency over fiat money seemingly holds true. Although it would appear unlikely for McAfee to ever be American president, he might improve his chances if he uses his crypto-campaign strategy well. His 2016 campaign strategy was quite argumentative, using the premise of “a paradigm shift” with a manifesto based on free trade and acceptance of the use of cannabis. Now, he has identified cryptocurrency and its growing community as a unique ticket to the upcoming election. His campaign focus for the 2020 presidential race will be mostly about cryptocurrencies, which have a growing community. McAfee seems to have his facts right, and if Americans begin to favor Bitcoin, a people network strategy could work in his favor. The post McAfee’s Bid For POTUS Race Stirs Crypto Community appeared first on BitcoinNews.com. This entry was posted in America, Americas, bitcoin, Bitcoin News, cryptocurrencies, Cryptocurrency, election, John McAfee, News, POTUS, Twitter on June 6, 2018 by adminbtc.